This fantastic PTFE Pizza Mesh Mat gives all round crispiness to your pizzas. 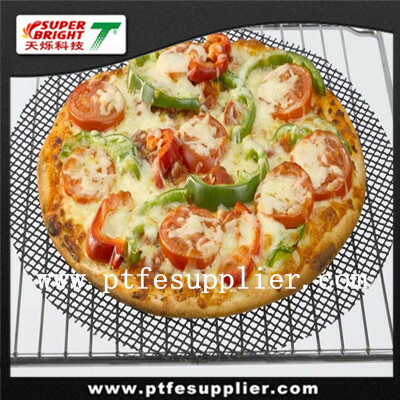 The innovative PTFE Pizza Mesh Mat sits directly on the oven shelf and doesn't stick to your pizza, ensuring that air will circulate when cooking to allow for perfect crisp pizzas every time. Prevent mess in oven , prevent sticky on oven , easy cooking ; heat resistant it allows better hot-air circulation ensuring all the part of the food heated and make the food crispy and crusty and the food does not have to be turned during the baking process Advantage. Can be cut any shape to fit for your oven , toaster , stove , gas cooker, pans ,cake tin , can be used when cooking , roasting , grilling , baking , frying. The heathier cooking invention that simply works , cook your food in its own juices, ensuring the food is low in calories and retains its vitamins.